BBC Radio 4 broadcasts every week day morning at 5:45 a program called “Farming Today.” In the Grumpy Vegan home — as one suspects in homes across the country — it is known as “Moaning Today.” Britain’s farmers are a moaning lot. There is, of course, much to moan about. Who doesn’t like a good grumble? After all, the Laying Hens Directive prohibiting the barren battery cage from 1st January 2012 was passed 13 years earlier in 1999. So, farmers have had more than a decade to prepare for the inevitable. Of course, the writing has been on the wall even longer. In 1997, for example, the EU adopted a Protocol annexed to the Treaty of Amsterdam, recognising animals as sentient beings. It’s not as if they didn’t know it was coming. Well, there’s always money. Or the lack of it to reinvest. Economic times are tough for most people, including farmers. But we all have to move with the times. We all live in a society which periodically requires us to change for various reasons. Moreover, the Grumpy Vegan can’t help but wonder what the life is of an industrial shed full of thousands of battery cages. 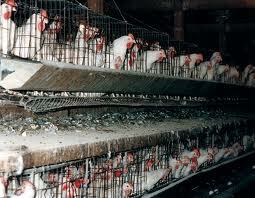 I don’t mean the birds but the infrastructure: cages, conveyor belts, watering systems, buildings, etc. At what point does the caging begin to rust? The conveyor belt collecting the eggs break down? The ammonia buildup in the shed’s enclosed atmosphere corroding everything? Bits of the wire flooring coming loose trapping the hens claws? Or the water droppers becoming clogged and no longer working or functioning badly? Wielding on the cage side coming un-down exposing sharp ends of wire stabbing birds who have no means of escape? In other words, battery cages can’t last forever. So, what is it? Ten years? 15 years? 5 years? However long cages may exist for — can’t believe they’re excluded from built-in obsolescence which most things have nowadays — it’s time for them to go. Farmers and the companies they work with have had more than enough notice. So, stop the moaning and do the right thing. And know, also, that whichever “enriched” cage system you install today will, if we have anything to do with it, become illegal in the future, too. So, why not go cage-free now? This entry was posted in Animal Rights, Moaning and tagged Animals in Agriculture. Bookmark the permalink.